Ajay Talwar of The World at Night took this photo in October 2012 of star trails over the construction site of the Devasthal Optical Telescope in the Himalayan peaks of Uttarakhand, India. Pillars of what will become India's largest telescope tower before dazzling star trails in this image taken from the campus at Devasthal Optical Telescope on the Himalayan peaks of Uttarakhand, India. Veteran night sky photographer Ajay Talwar of the astrophotography group The World at Night took this photo in October 2012. The 3.6-meter segmented optical telescope will be the largest telescope in India when complete. It is expected to be operational by late 2013. 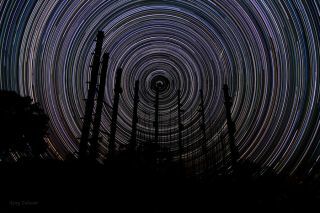 "The circumpolar star trails in the sky span the entire true night, between the end of evening astronomical twilight and the start of morning astronomical twilight, 9hr 41min. Dhruv Tara, the Pole Star in Hindi, has rotated around the celestial pole by 145 degrees,"" Talwar said. Long exposure times can create star trails in a night sky image. The exposure causes the stars to appear as if they are trailing in arcs similar to the path they trace in the night sky. The images show how the rotation of the Earth can influence the motion.